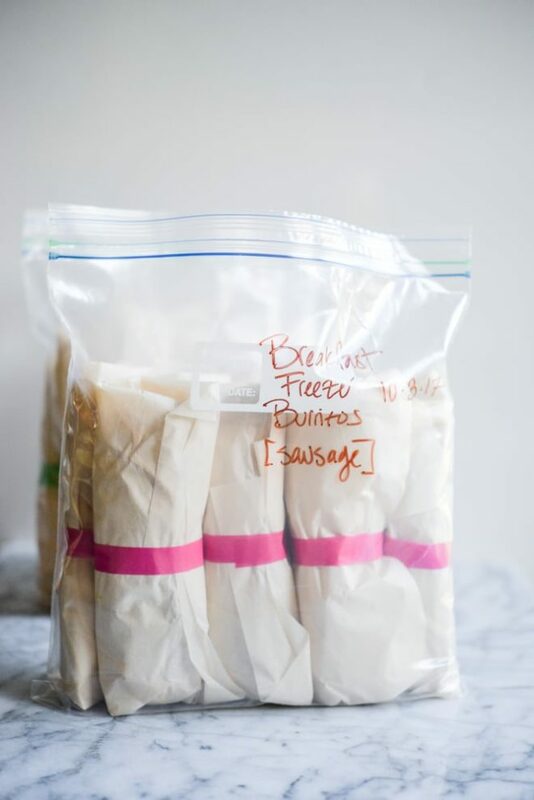 These make ahead Homemade Freezer Breakfast Burritos are the perfect option for rushed mornings when getting breakfast on the table is a challenge! 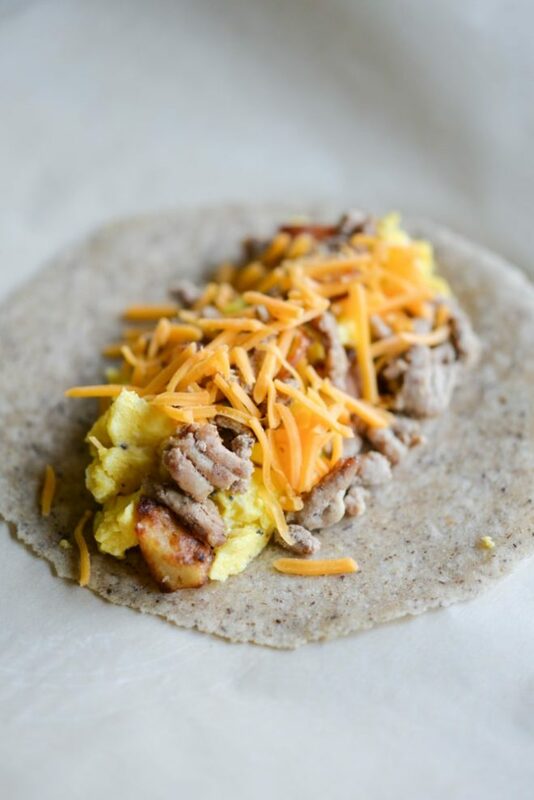 These breakfast burritos have gluten-free, Paleo options and step-by-step instructions. 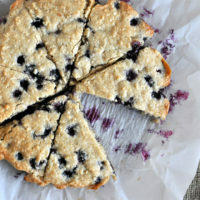 I am so FREAKING excited about this recipe! For the past several months, I have been hard at work preparing for baby girl's arrival. We've been working getting our house ready, which of course far exceeded efforts just to furnish a nursery. Nesting has taken over my downtime with an overwhelming desire to clean out our pantry, garage, prop closet, kitchen, and my closet. My team and I have also been pouring a LOT of effort into planning my maternity leave. 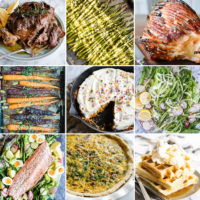 We've been working to build a nice, cushy 3-month backlog of great recipes, podcast episodes, and other healthy lifestyle pieces so that you will have plenty of inspiration to carry you through early 2018 while we're caring for our new little one. One of our biggest efforts to prepare for baby girl has been to stock up on homemade freezer meals. After writing the Fed & Fit Book, I learned the important value of a freezer meal. While recipe testing for the book, I wound up freezing a LOT of the food …which came in so, so handy when my work transitioned to the hermit-like editing phase. 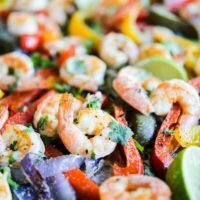 Healthy freezer meals helped to keep me away from the (easy button) takeout menu because I had an even easier, even tastier option right in my own home. We applied the same principle when preparing for baby! While we cooked to get ahead on recipes for the blog, I was diligent about packaging the meals for future enjoyment when our hands are a bit more full. 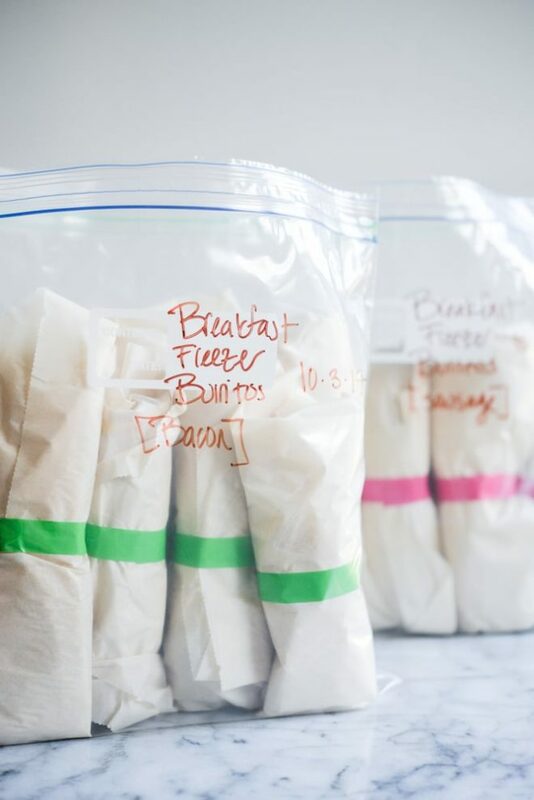 I'll share more about how exactly I stocked my freezer for baby (including best practices for portioning, defrosting, etc.) in a later blog post, but today, we're zeroing in on my favorite freezer meal of them all: the Homemade Freezer Breakfast Burrito. Meal-prepped breakfasts can be tough, especially when you want to freeze them in advance. This recipe went through several rounds of development before we finally cracked the code on the BEST way to make and then defrost the ideal frozen breakfast burrito, but by golly we nailed it. 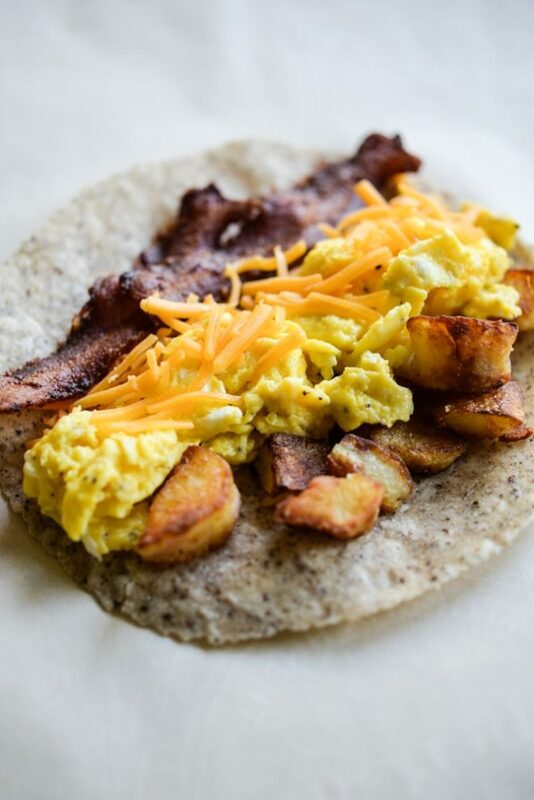 This recipe caters to MY personal preference for a breakfast burrito: half bacon, half sausage, and both options filled with a little scrambled egg, crispy breakfast potato, and a touch of cheese. 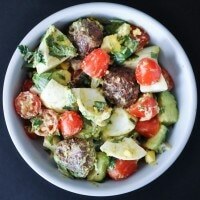 You can ABSOLUTELY omit any of those ingredients and/or swap in your own favorites! I've also made these with sautéed mushrooms + spinach, which were also delicious. The real trick to these breakfast burritos is in how we prepare the tortilla. As you may well know, I prefer to fill my diet with as many grain-free foods as possible. 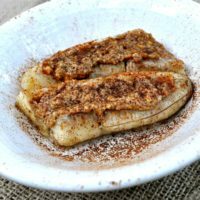 While I will occasionally enjoy a fresh corn tortilla, I wanted these freezer breakfast staples to be made with a tortilla I really trust to make my body feel well: the Siete Grain-Free Paleo Tortilla. These tortillas come in 3 different varieties and while all of them will work, I found that the Cassava + Coconut yielded the best reheated texture. Gather all the ingredients you want in your burrito. Cook everything to doneness (crisp the bacon, brown the sausage, scramble the eggs, prepare the potatoes). Prepare the from-frozen Siete tortillas by heating them in a skillet WITH a bit of water. This steaming process helps to make the tortilla more pliable so that rolling (and then reheating) is easier. 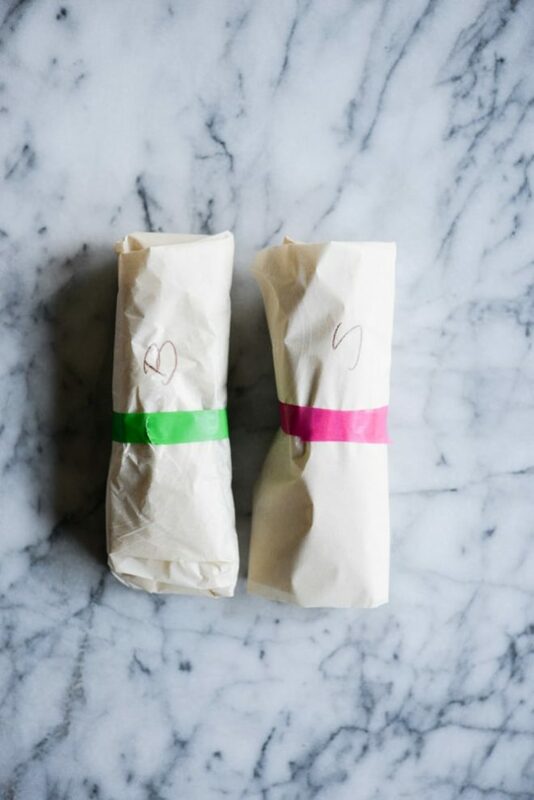 Stuff your burrito, roll it up, and wrap in either parchment paper. Place all your individually wrapped burritos in a large freezer-safe resealable bag, label with the date, and pat yourself on the back! To defrost: simply unwrap the frozen burrito and microwave for 2 to 3 minutes, or until it's nice and hot again. NOTE: if your frozen burrito looks like it has a dry or cracked tortilla, you can likely salvage the end texture by wrapping it in a damp paper towel and *then* microwaving. The steam could help it come back together. 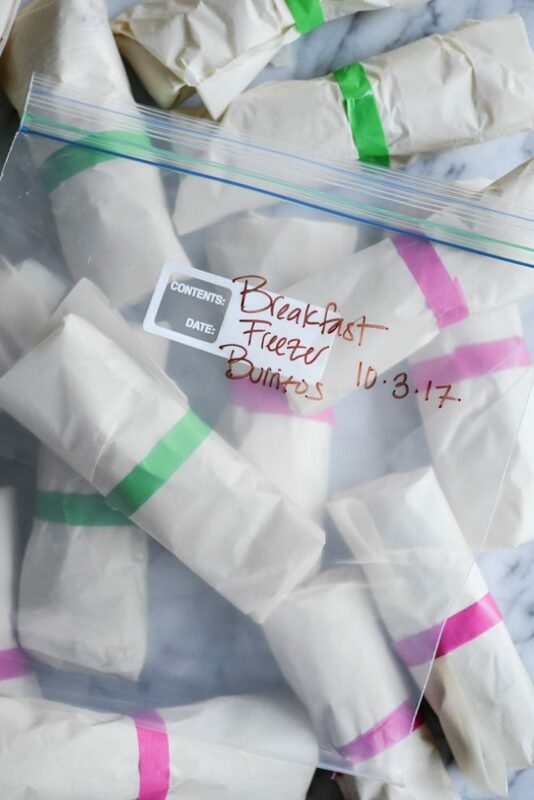 I now have a nice big bag of these Homemade Freezer Breakfast Burritos stored up and I just KNOW they'll come in so handy once our little girl arrives. 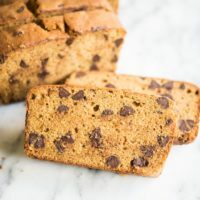 I hope you find this recipe helpful! Please come back to this post and share your tips, tricks, and favorite flavor combinations. It's always so helpful to see how you make these recipes work! For the potatoes: Either pre-bake (for about 30 minutes), boil (20 minutes), or microwave (about 6 minutes) the potatoes until give slightly when poked. Let cool to touch. Cook the bacon or sausage (or both, depending on what kind of tacos you want) until crispy. While bacon is cooking, remove the peels from the potatoes, and dice them into once inch pieces. Once bacon and/or sausage are finished cooking, drain half the grease from the pan. Return pan to medium-high heat and add the sliced potatoes. 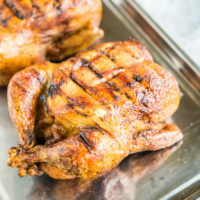 Cook for 3-4 minutes, flip, and cook for an additional 2-3 minutes, or until browned and slightly crispy. Remove potatoes from the pan and place on a paper towel to drain excess fat. Crack eggs into a large bowl and whisk with salt and pepper. In a large skillet, melt butter over medium-low heat. Once melted, pour in eggs and scramble until desired texture is achieved. I prefer to use a spatula to lightly stir my eggs until they just slightly firm up. For the tortillas: place a small pan over medium-low heat and add a sprinkle of water with your fingertips. Once the water is sizzling, add the tortilla, cover the pan, cook for one minute, then flip, cover, and cook until the tortilla is very pliable. Repeat for each tortilla. 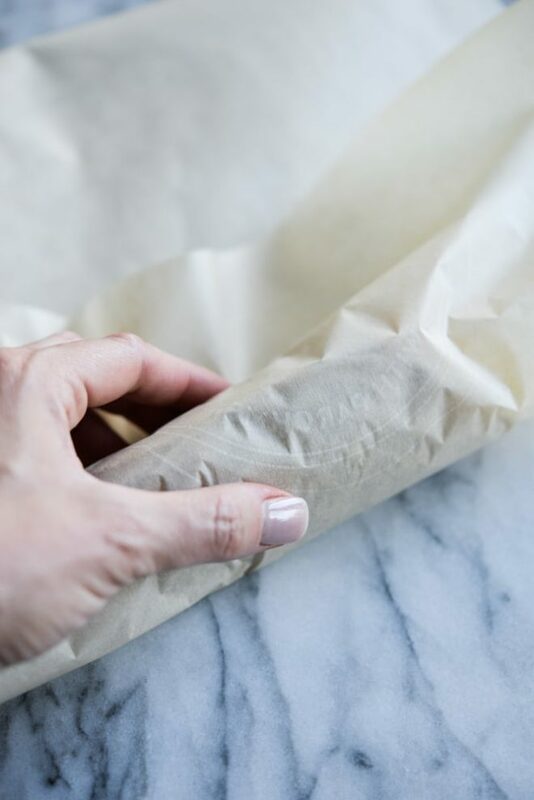 To assemble: place a tortilla on a piece of cut parchment paper. 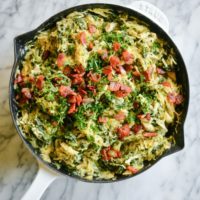 Add eggs, potatoes, bacon or sausage, and cheese (if you like). 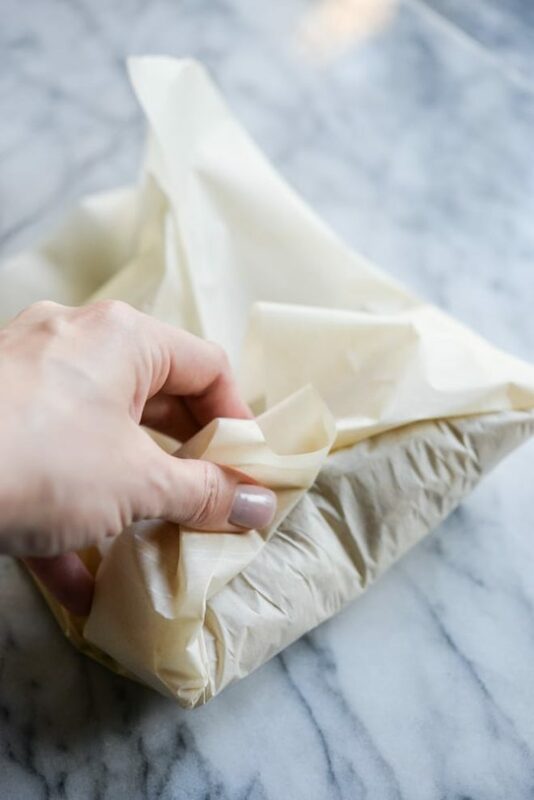 Fold in the sides and roll, making sure to use your fingers to keep in all of the filling while rolling. 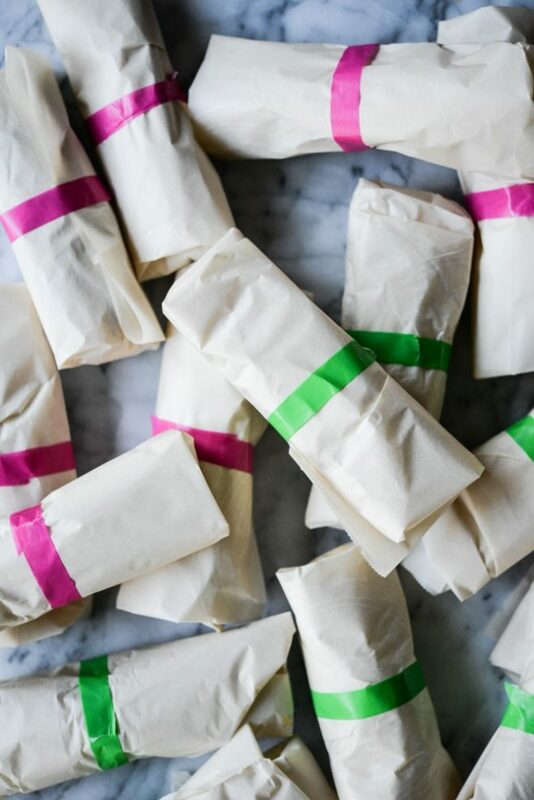 Wrap in the paper and tape (or rubber band closed), then put into a freezer bag and place in the freezer. To reheat from frozen: remove tape and microwave for 60-90 seconds on high. NOTE: If your frozen burrito looks to be broken, torn, or dry, wrap in a wet paper towel before microwaving to reheat. The moisture in the paper towel will help the tortilla stay pliable and will hold your taco together. 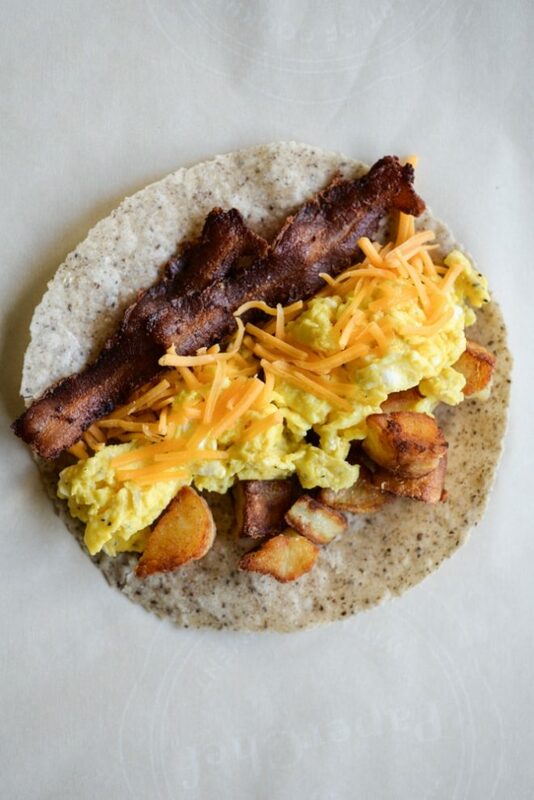 This recipe will yield 8 bacon tacos and 8 sausage tacos. If you'd prefer all bacon or all sausage, double the amount of bacon/sausage. 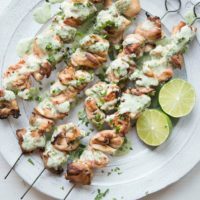 While all 3 versions of the Siete Foods Paleo Tortillas will work in this recipe, we found that the Coconut and Cassava version reheated and held up the best! I love this idea, and I love the concept of Siete tortillas, but they fall apart on me every time and become useless and frustrating! Any feedback on how to avoid this?? Thank you!! Hey Brittany! The instructions here call for cooking each tortilla in a teaspoon of water and that helps immensely with their pliability! Hi Brittany! They will crack if you’re not strategic in how you heat them up. The instructions I’ve provided here (steaming them with water) helps tremendously. Love! In our home we meal prep because feeding an always hungry teenage boy is a never ending Mom job. 🙂 Any thoughts or suggestions for reheating when one doesn’t use a microwave? Thanks so much! You can put in a skillet over low heat and cover with a lid! OR – you could also place them in the oven until warm. Hope that helps! Hi Cassy! Thank you so much for all of your fabulous recipes. My husband is a UPS driver and this time of year is super crazy. This is going to be a game changer in our house! You’re the best. Awesome!! I hope y’all love them! I am super excited to try these! 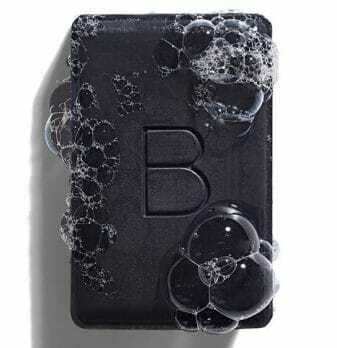 I have needed something like this for my quick morning routine! 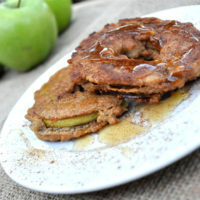 I was wondering if you could pass along your favorite breakfast sausage recipe or brand? I have concerns about the packaged sausage ingredient list at the stores and haven’t found a way to make it from scratch that I am too crazy about. Thanks!! My favorite breakfast sausage comes in my monthly ButcherBox (www.butcherbox.com/fedandfit)! I hope that helps! 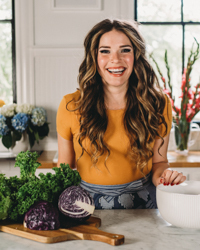 Melissa – I have found a brand called “Mulay’s” in the freezer section of my local Natural Foods Grocer by Vitamin Cottage (’round here we just call it Vitamin Cottage). Also Applegate Farms is pretty good. Lastly, I just got my first shipment of Butcher Box breakfast sausage and the ingredients are pretty great (and the meat pastured). I *think* Cassy is in to Butcher Box and if so I’m sure she can pass on a code to you to get some free meat incentives to sign up! 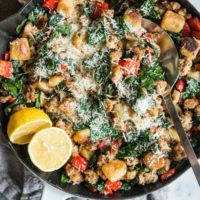 Cassy – hat’s the best way to finish the potatoes for this recipe after you boil them? Thanks! We recommend peeling them, dicing them, and then frying them up in the excess bacon grease in Step 3! In a hot skillet with some fat for a nice crisp! 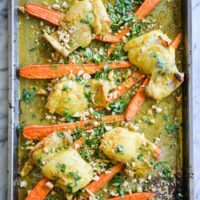 I was super excited about this recipe! However, I must have done something wrong.. when I heated the tortilla with the water all it did was make it super sticky! I stopped after the first too b/c it did not seem right. I tried wax paper (will not do that again!) 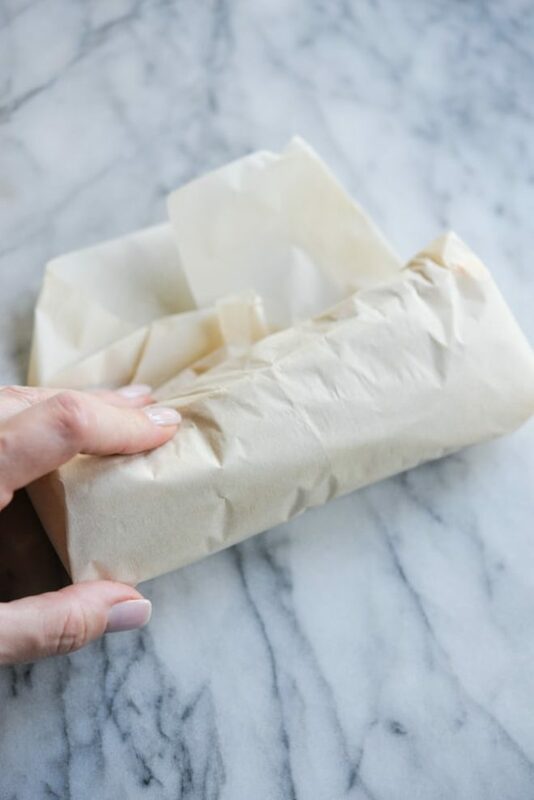 b/c I did not have enough parchment and I ended up with a wax paper burrito – the paper would not come off when I reheated! I even wrapped it in a damp paper towel in hopes that would release it but it just stuck to it also! Any advice? Thanks! Hi Amanda! OH that’s a bummer. The stickiness is actually a good sign that the reheating method is working …but it shouldn’t stick so much that it adheres to the wax paper. Parchment may work better …and maybe a little less water? Yes! 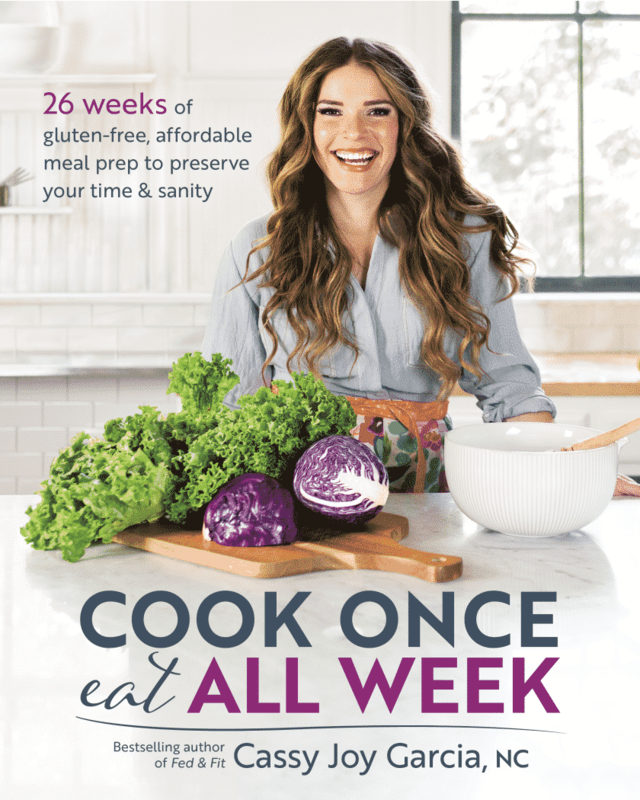 When I was pregnant with my daughter, I froze a bunch of soups! Big mistake! It is crazy hard to eat soup with a baby strapped to your chest. Burritos are definitely the way to go. And smoothies… lots and lots of smoothies. Hi Cassy! 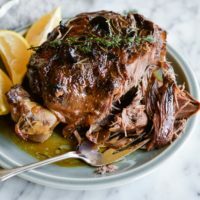 I love following your blog and instagram; however, I was so disappointed with this recipe, specifically with the amounts of food it called for. It was hard to fit enough of any of the ingredients into the tortillas before rolling them up (without them breaking…yes I used the cassava/coconut and yes I heated in the pan before making), so I was left with about 2 potatoes, at least 6-8 eggs left worth of scrambled eggs, and maybe 1/3 lb of sausage. I’m not sure what I did wrong…:-( On the positive side, it’ll make for a great breakfast hash tomorrow! But I’m bummed that my burritos turned out so small and probably won’t be as filling of a breakfast as I thought they’d be upon making them. I’ll have to call Chipotle and ask them where they get that massive tortilla stretcher thingy so I can use that the next time! Sorry you were disappointed, Jenna. These are the portions that worked for us in our numerous tests. I couldn’t seem to get everything into the burrito and warmed up. I thought maybe I bought the wrong tortillas, but I just double checked and they looked correct. Any tips for folding up the burritos??? The insides tasted wonderful so in the meantime I had a burrito bowl!! My first thought is that you may have overstuffed the burrito! You want to make sure that you fold the tortilla over the filling and tuck it in really tight, then continue rolling. Once the burrito is rolled, go ahead and wrap it in the parchment paper. Made these today to prep for baby #4. Technique worked perfectly. Thanks! So glad you liked them Amie! 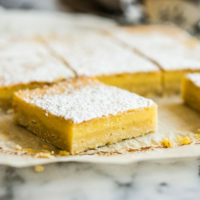 I know this isn’t a new recipe of yours by any means, but i just want to let you know how much I ADORE it. 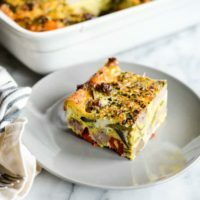 I’ve been making a big batch of these every month or so for the past year (sausage, bacon, and black bean), and they are such a perfect grab and go breakfast to make mornings a little less crazy. Some breakfasts can get boring after a while, and I don’t think my boyfriend and I will ever get sick of these!! THANK YOU for all that you do! Yay! So glad you and your boyfriend are loving them! !